Its a new master, and has been reframed from the older DVD master. Its a very dark transfer, I first saw it on VHS so am unsure if this is the way it is meant to look. It blows the dvd away for me, but then its hard not too. If you can live with the blocking and the dark picture its a good price for two cool movies. I thought this double feature looked pretty decent for what it is. Both movies are greatly improved upon their dvd counterpart. Just a bit dark though. Glad I got this disc. I'm quite happy with the way it looked. I never thought I would see this on Blu-ray anytime soon, so to get it with decent film-like PQ for a cheap price is ok by me. About the darkness issue. If you look at the first set of comparison shots, you'll see the DVD has blown out whites. The billboard is completely unreadable. Whereas the Blu-ray has corrected this. I don't know how this originally looked, but the Blu-ray IMO appears a lot more natural and correct. It does indeed look more natural than the dvd but compared to the rest of my BD collection, the disc is a bit dark. Nothing terrible though. I like this disc a lot. Good A/V for two movies on one disc. Not bad. The BD is 100% correct and this shot is the most obvious. The DVD is washed out. The BD looks so natural and clean. Colors look spot on. 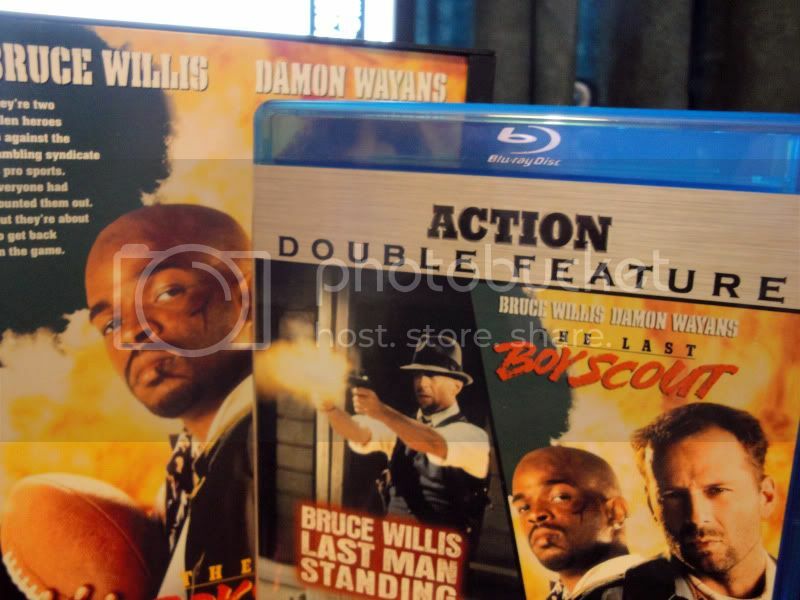 Look at damon waynes pants on the DVD. Charcoal gray. The BD is pure black. Looks spot on. I remember seeing the movie in the 90s and thinking it was very dark. The film is dark. I have a 35mm trailer for it and it's dark as sin. Love this film in a guilty pleasure way. Wow, the DVD is an abomination! Been years since I've watched it. I had absolutely no idea this was coming...I'm honestly a lot more curious about Last Man Standing, though, but still... Ordered. It wasn't hard to ignore, but it was quite obvious there was some "scrubbing" done. If this was the worst it ever got AVS wouldn't be using nearly as much disk space. Other than that it wasn't bad at all. And it wasn't too dark, it looked fine. Scott's intent came through quite well. "Touch me again, I'll kill ya". Love that scene. If this was on a bd50 I think we would get a better idea of the transfer, there is way too much macroblocking going on. I just don´t understand why Warner leave so much space left on the discs that could have been used for a higher bitrate. Those 4 gigs that´s left might have eliminated some of the blocking. Warner goes for the lowest possible bitrate. It's just the way they do things. Has anyone ever gotten an explanation as to why they do that? It almost sounds like one of those corporate procedures that everyone does but never questions. They get charged by the 'bit'. That probably makes more sense than the real reason even though it is most likely not the case. It may also have something to do with the fact that they have the highest volume of releases on BD compared to most studios. I am not saying that is a justification but maybe a theory. Warner owns their own authoring house for Blu-rays, GDMX. They determined target bitrates for their encodes on HD DVD years ago. Due to corporate cost-cutting, those rates are largely still used on their Blu-rays. Sadly, the limited bandwidth of HD DVD continues to haunt their Blu-ray video encodes long after that format was vanquished. It is all about as much automation of the compression process as possible in the cheapest manner for them. I suspect many of their releases get little oversight by a human, leaving transfers riddled with easy to spot macroblocking and artifacts. I doubt anything will change regarding WB's practices. Most of the other studios have also automated the process as much as possible, but are using more advanced and recent AVC encoders at much higher target rates. Ergo, those encodes show fewer problems. Probably the closest to the truth of the matter. The BD blows the older DVD away! The DVD version was a early release, released in early 1998, when transfer quality wasn't as good as it is now. I concur I saw it in 70 mm when it was out and while nice and big and detailed it was dark. Warner sure loves orange skin tones on their new transfers huh? (see The Neverending Story for another example) Otherwise one of Warner's best catalogs with some of the best looking grain I've seen from them. Some shots look like they have a little bit of that fake tan cream on. All in all, seems tolerable and a pretty solid transfer. On the second from last image on bottom, at least the car reflection light is now red as to be expected and not orange like the broadcast. I just got the german/european Disc of Last Boy Scout yesterday. I could not reproduce the blocking in this Scene. Is it possible that this was simply an error on the US Disc? I skipped frame by frame and could not reproduce such a heavy blocking. Could be an interesting Info for people who doesn't have the US Disc yet.